We got the go-ahead from our GI doc to cut down the amount of formula by g-tube to try to make Evie a little hungrier. There is a whole world out there about different philosophies of weaning kids off g-tubes, and I won't go into it here, but it's truly making my head spin. 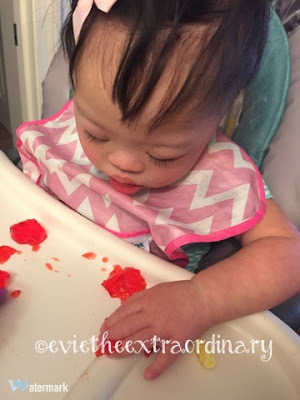 I am just going to give this plan a chance (of reducing 20%*) and give Evie a few weeks to figure out that food is even more fun than she thought. We expect she will lose a few ounces here and there, and our goal is to use some food strategies to keep her from losing too much weight while she expands her food horizons. The most important lesson for the summer is: FOOD IS FUN, EVIE! So you need your kid to gain weight. She doesn't even eat food with too much texture yet. She can eat purees and yogurt, and that's about it. How do you expand her palette and avoid food aversions at the same time? I haven't come across a comprehensive list of food tips, so I'm going to write down what I've learned so far as notes to myself, and I invite any other tips so I can make a more comprehensive list! Add olive oil to either g-tube feeds or any purees or blended foods. At this stage, we are doing 1/2 teaspoon of olive oil in 100 ml milk by g-tube. Avocado: blended, mashed, whatever way you can get it in. My friend adds some vanilla and sugar to the avocado for her son. Evie is working towards this but the weight of the food on her tongue still makes her gag. Turns out she likes it mixed with her food pouch for some flavor and some almond milk to thin it out a bit. Full milkfat yogurts and smoothies. Enough said. We mix in Siggi's 4% milk fat yogurt (wild berry flavor) with some of Evie's purees. These are an expensive habit, but whatever works for Evie! Use a base like mashed potatoes or mashed sweet potatoes or avocado, and mix in butter or olive oil or coconut oil. 2. ADD GRAINS: OATMEAL, QUINOA, BARLEY, AMARANTH, ETC (I still don't quite know what amaranth is!). As Evie gets less Pediasure Peptide by g-tube, we need to boost carbs. So we are adding baby oatmeal to her purees, and gradually adding more and more to increase texture exposure. She's doing great with this! 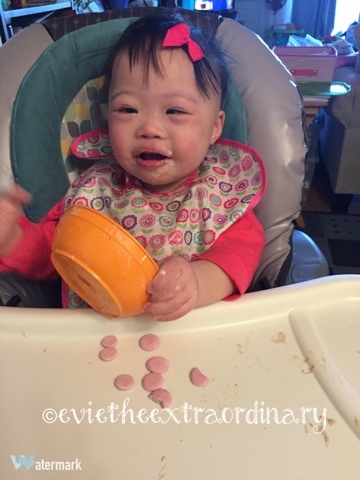 Gerber makes flavored baby oatmeal in little packets, and Evie is currently enjoying apple and sweet potato flavor oatmeal in her purees. Cheerios: Evie says I like to throw these on the floor. Puffs: Evie says "what is this dried piece of styrofoam you are putting in my mouth? ptooey!" ...and jello! Evie likes to play with jello, which is awesome for food play! She will actually eat it! This jello stuff jiggles, Mama! 6. REFRESHING DRINKS/TREATS: Yay for summer! Have a food "picnic" every day and put different foods on the blanket and make tasting a fun thing. Once the child is significantly close to fully weaned, food has to be available frequently to encourage eating. Put small amounts of different types of food in an empty ice cube tray and make tasting a game. 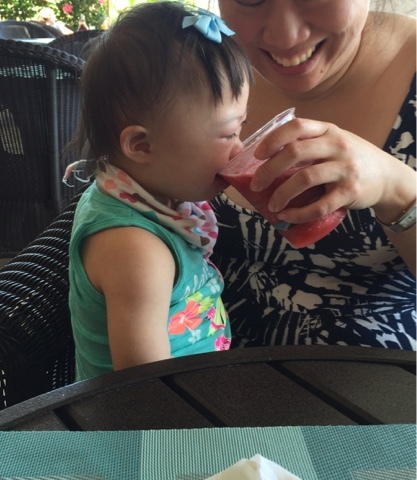 Drinking is a challenge if it's hard for the child to coordinate their oral muscles. Thickening liquids so that it's too thick to flow fast and too thin to stay stagnant in the cup makes it so the child can learn to practice swallowing at a slower pace. Evie is practicing with applesauce and smoothies. A big thank you to the parents who have gone before us and are sharing their tips! Keep them coming! *To be continued about whether 20% is good enough to induce hunger in a child who is being fed continuously by g-tube overnight and having 3 bolus feeds by day. I had wanted to do 30% and then 50% reductions, but the doctor suggested 20% first, so we will try that and see.